Project Life (Week 1) | I am JuJu! One of my goals this year is to document our every day life. I mentioned in a previous post that I am doing this using Project Life. 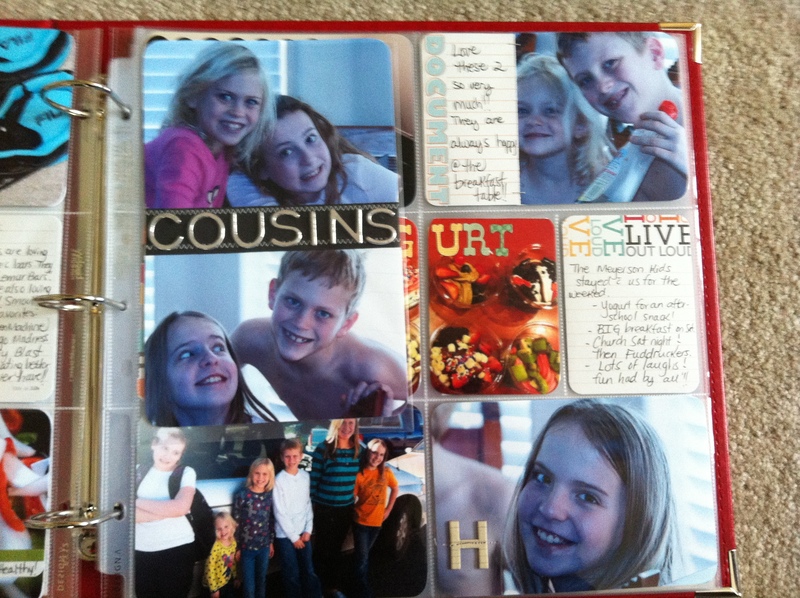 I am definitely not a traditional scrapbooker like I used to be. I really just want to track our day to day. I don’t necessarily want to make a 2 page layout of every birthday and holiday. Yes, those are important, but so is our every day! I want to document the ins and outs of our little family of four. Even during the times that I wasn’t scrapbooking a lot, I was ALWAYS taking pictures. I love to look at those pictures and see the differences in my children, and not just the physical differences. My children are progressing cognitively and emotionally on a daily basis, even if it is at a slower rate than most. Raising a special needs child can be pretty overwhelming at times. Sometimes I feel that days run together and before I know it I’ve blinked and 3 months have passed. It’s easy to get into a routine with school, therapy, and doctor’s appointments and not really embrace the joys of the day to day. It’s easy to think that your kids aren’t improving and progressing even though they are. 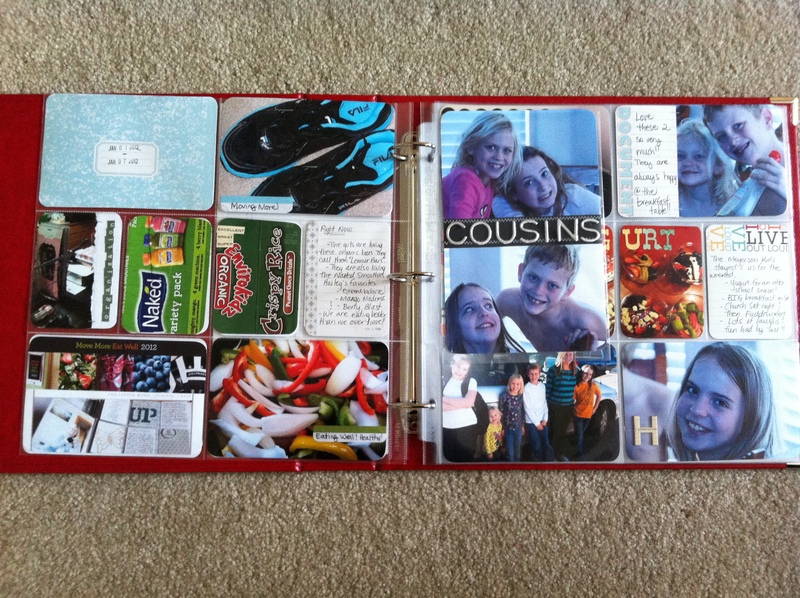 So this year, instead of always feeling like I’m behind with the girls’ scrapbooks and giving up before I even start, I decided to do project life, which is manageable! Last week I took pictures whenever I thought about it. I took them with my good camera & with my i-Phone camera. I also kept the packaging from several of the new foods that the girls tried. This is a big deal in our house as they aren’t willing to try new foods very often. When I sat down to put the pictures and packaging into page protectors I didn’t “over think” it. I don’t care if I’m using the latest and greatest products. For those of you who have actually seen my scrapbook room, you know that I have enough product to complete 50 albums without ever having to go to the store, except for adhesive. It is actually embarrassing! If they ever had an episode of Hoarders-Scrapbook/Craft edition I would definitely be featured. As I was putting this week’s layout together, I found some gaffer tape that I remember buying when my brother in law Jeff arranged a crafty weekend for me and my sister right after she finished cancer treatment. Oh ya, that was over 6 years ago. Well, you know what? I used that gaffer tape today and I couldn’t be more thrilled. I have products from companies that no longer exist, but I’m going to use them. You know why? There are no rules! I’m making this album for us, not for anyone else. When I finished my pages today I told Chris “I really enjoyed doing that! My pictures aren’t the greatest and we didn’t do anything huge this week, but we had a good week and it is documented!” I urge you to pick up your camera and take pictures. I really encourage you to pick up a pen and journal just a bit about what is going on in your life right now. I really think that it’s the little things in life that add up to big memories. This past weekend I guest posted on my sister’s blog about some of the things I remember from our childhood. You can read that post here. When I was recalling different events, I noticed that they weren’t big trips and big gifts that I remembered. I remembered the day to day happenings within our family of four. I wish I had more pictures from when I was growing up. I have some, but not a lot. I would love to have something like Project Life where I could read about my mom’s day to day thoughts. Her struggles. Her fears. Her successes and our successes. I want my kids to have that too! So without further ado, here are some pictures of my layout from this week. This is a snapshot of what my book look likes opened. This is our week in review. This is the left page. This is the right page. The picture on the top left is of our hyperbaric chamber that Skylar gets in each day. You can see that our dogs love to lay right next to it while she’s in there. The other side of the 5.5×8.5 page protector. I enlarged this sweet picture of Hailey and my niece & nephew. I love how he is giving his sister a kiss. All the kids are just totally in love with this feisty, little one! I can’t encourage you enough to pick up your camera and your pen and document your life. Whether you are single, married, have no kids, or have 10 kids, your life is relevant! This entry was tagged project life, special needs. Bookmark the permalink. 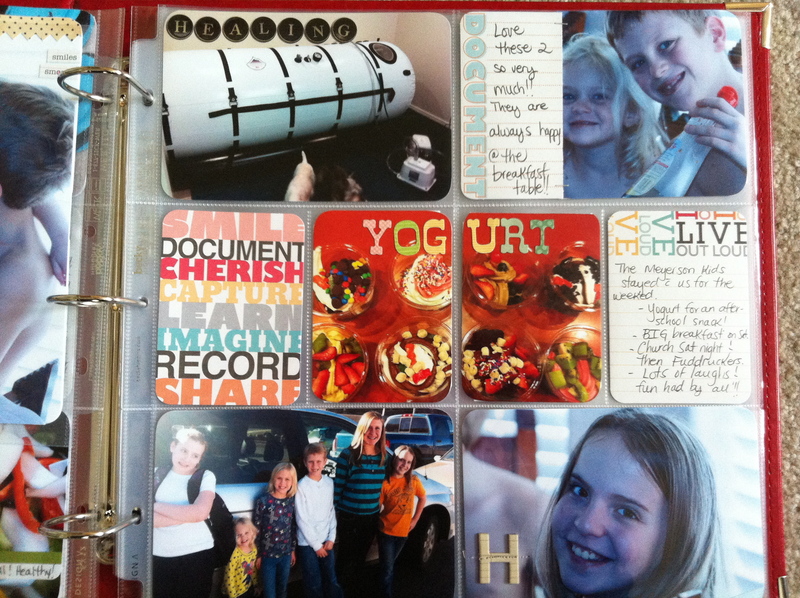 Hey Julie … this is my third year for Project Life … and I LOVE it too! Thanks for sharing your thoughts and ideas … and don’t worry if they had that Scrapbook Hoarders Show I’d be right on there with you!!! My One Little Word for this year is REDUCE and I’m trying to implement it in all aspect of my life this year … so I’m trying to use more of my stash instead of buying all the time … so far … so good!! Hope you keep sharing!! Hi Amy! I’m enjoying just being in my craft room again. My word this year is focus and I’m really working on focusing on the important things: my family, my health, & my faith. Yay Julie! 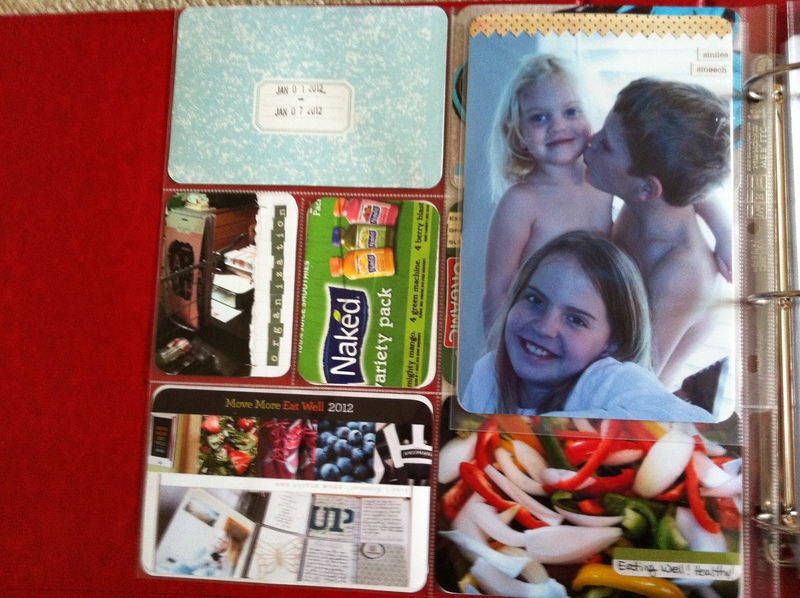 So glad you are joining the masses in doing Project Life this year. I love the pages- they look just like you. And I think I have 10 rolls of gaffer tape. Time to bust it out. 🙂 Love the Naked Juice packaging. Thanks Jenny! I have quite a bit of gaffer tape too. I’m determined to use this stuff! Thanks for the encouragement! Kudos to you for taking this on and thanks for sharing your photos. I started this last year and although I didn’t get an album put together, I did journal every day and took several photos every day. I have the year documents online…just need to print and assemble now! BTW, I am using http://www.ohlife.com for my journaling. Love it!!! They send me an email every day at the same time (you pick the time) asking how my day was. I simply type in my day’s notes and hit send. The entry gets added to my online journal* which can be perused, edited and downloaded (in several file formats) any time. Easy peasy! Just thought you and your readers might be interested in an easy journaling too that’s free! *Note: Every month I download it just in case something happens to the online file or company. Hi Stephanie! Thank you so much for sharing that link. I will for sure check it out. It sounds fabulous! Thanks for all of your encouragement! You Rock! !